The Green Belt Movement uses a watershed-based approach to restore degraded watersheds of key water catchments so as to improve their functions and improve the livelihood of the local communities. Being an integrated approach, it sustainably supports and diversifies the sources of income for the communities neighboring the forest by generating income from tree planting activities and promoting alternative and profitable use of the forest. 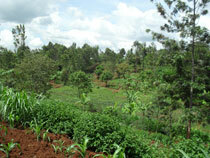 Since 1977, GBM communities have planted over 51 million trees in Kenya, in watersheds in the highlands of Mt. Kenya, the Aberdares, and the Mau Complex- three of the five major mountain ecosystems in Kenya, as well as on private lands. GBM also plants trees on public lands with institutions such as faith based groups, schools, and has a partnership with the Kenya Army to help access remote areas for planting and tree planting on army lands.